April 20, 2005 Dayton, Ohio - Around 11 a.m. Sunday, August 24, 2003, at the Brush Creek bridge in Peebles, Ohio, a family saw "an oddity in a nearby soybean field that was not natural." It turned out to be an extraordinary crop formation in soybeans only a half mile from the tail of the famous Serpent Mound mysteriously built a thousand years ago to be seen from the sky, but no one knows why. 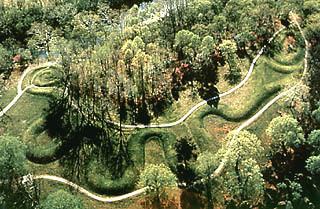 Photograph of ancient Serpent Mound near Locust Grove and Peebles, Ohio. Mound is 800 meters long (.5 miles) and its construction is placed around 800 A.D. Soybean formation was 3,000 feet ( a little more than a half mile) to the east of the serpent's tail shown at left of photo. Image courtesy Wright State University.